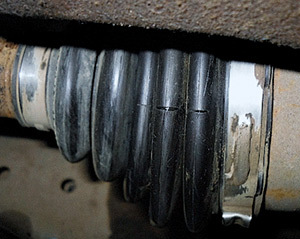 To prevent disruption of the dust cap of the constant velocity joint it is necessary to conduct visual check the condition of the CV joints dust cups. It is recommended to replace the dust cap by appearance of disruptions, cracks, before it is completely destroyed. It happens more frequently with old cars because of aging and hardening of rubber and appearance of cracks. But if the dust cap has nonetheless torn, it is necessary to replace it. If it has happened recently, and the constant velocity joint is not yet damaged, it is recommended to disassemble the unit and to clean it from the old grease. After that pack it with XADO Grease for constant velocity joints for the whole service life. Install the CV joint together with the new dust cap. If the CV joint dust cup disruption happened long ago and it was contaminated, which led to the accelerated wear of the parts and appearance of crackling when a car turns, it is recommended to replace the regular grease with XADO Repairing grease till the defect is removed. Read “Crackling of CV joint”.